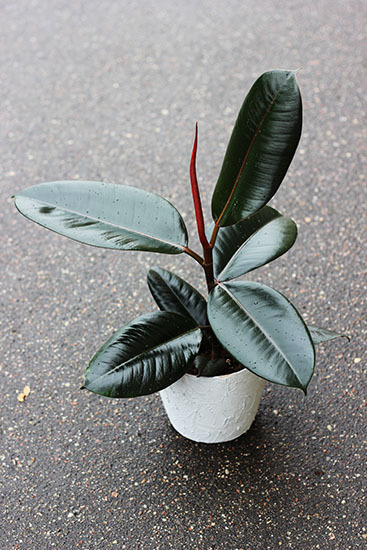 The Rubber plant is a popular houseplant, owing to its ease of care and ability to thrive in a variety of conditions. The plant is unconcerned with humidity and can survive at both low and high temperatures. Its main requirements in terms of care are the need for plenty of bright, indirect light. Though it is a very easy plant to grow, demanding little attention, it will not do well in shaded areas or rooms with low light. The common name of Rubber plant comes from the latex sap, which is contained in both the foliage and stem of the plant, and was originally used to make rubber (Rainforest Alliance). The Rubber plant enjoys a happy medium when it comes to watering, neither dry nor soaking wet but somewhere in the middle. The frequency of watering will depend on the conditions of your home and where you live, though generally a good watering every week throughout the growing period will suffice, with this becoming less frequent during colder seasons. The Rubber plant grows fairly quickly and therefore gets quite thirsty during its growing period, so will benefit from heavy watering. However, it does not like to sit in soggy soil, so ensure your plant has good drainage and avoid overwatering. If the plant has more water than it can use, it may begin to suffer from root rot. This can be easily avoided by checking the soil with your finger before you water it, and if it is dry to the touch, then you are safe to go ahead and water it. 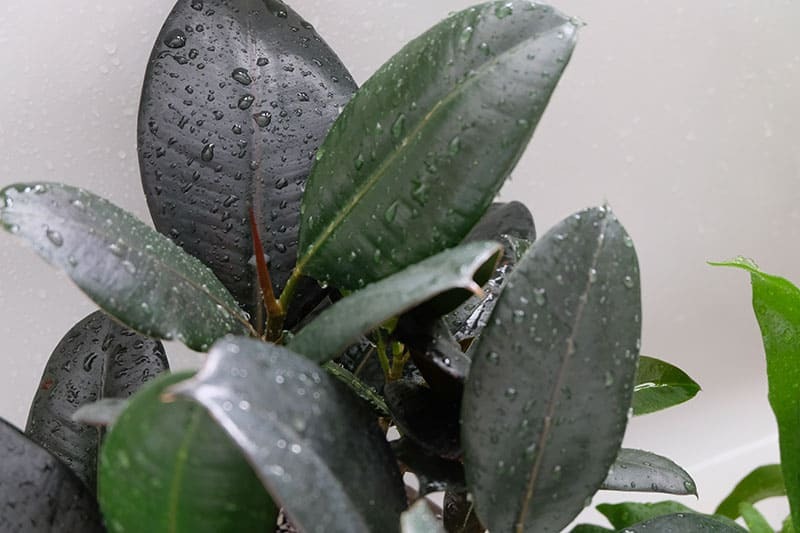 The Rubber plant isn’t too fussy when it comes to humidity, and should be quite happy kept in the regular humidity conditions you find in homes. If the leaves start to look dry, you can mist them with a spray water bottle, but this isn’t a necessary part of a Rubber plants routine care unless you are experiencing exceptionally dry air. 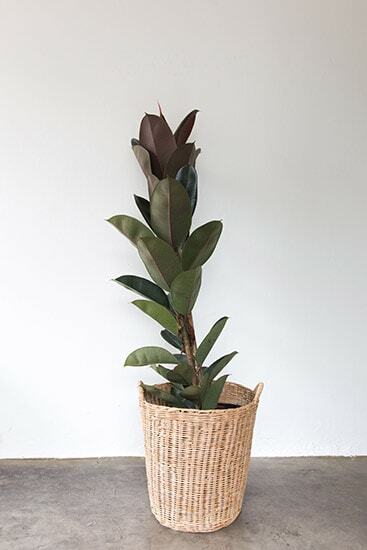 The Rubber plant does well in a broad range of temperatures, from 50-85° F. It can quite happily withstand both high and low temperatures, though anything over 85° F will result in the foliage losing its plump appearance, and leaves may look neglected and shrunken. Low temperatures can be tolerated, though anything lower than 45° F would be considered risky. The plant may be able to survive during temperatures as low as 40° F, though watering at this temperature would have to be very precise; otherwise; overwatering at such a low temperature would certainly kill the plant. While the Rubber plant is tolerant to a variety of climate conditions, it doesn’t like sudden change and should, therefore, be kept away from cold draughts or sudden temperature drops. It doesn't like to be moved around too much, either, so find a place for it to live where it will be happy all year round, away from a door or window where cold bursts of air may be an issue. 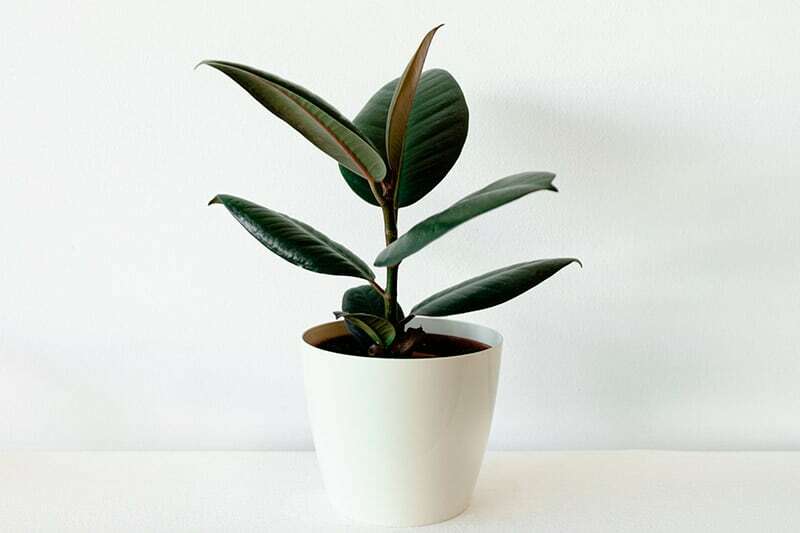 The Rubber plant enjoys bright conditions, away from direct sunlight. It shouldn't be kept in rooms with low light as it will struggle to thrive and experience stunted growth and other problems. While it will do best in bright, filtered light, it can tolerate a few hours of direct sun each day, preferably during the morning when the sun is not at its strongest. Too much direct light will result in the leaves becoming scorched. 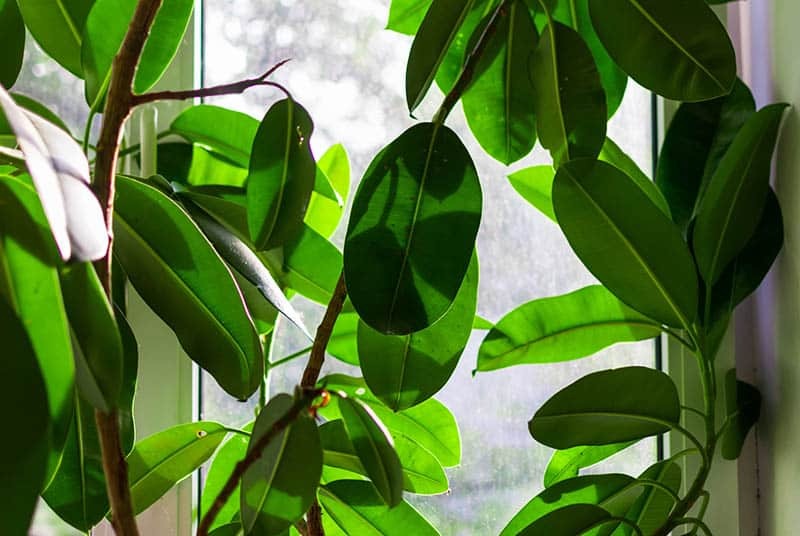 If your room receives a lot of direct sunlight, you should think about finding a new home for your Rubber plant in a different room, or using curtains or blinds to filter the light. Varieties of the Rubber plant with the typical glossy green leaves can do relatively well in partially shaded areas, though you will need to keep an eye on its growth because a lack of bright light can result in the plant becoming scrawny looking. If your Rubber plant has variegated leaves, then low lit conditions are not an option. Bright light is required for these plants to maintain their markings; otherwise, their colorings will fade, and they will look much less healthy and appealing. When your Rubber plant is still young, it will need to be repotted each time the roots become pot bound, usually annually. To repot, remove the plant from its current pot, being careful not to harm the root system, and gently remove excess soil. Then, choose a pot with a few extra inches of growing space, and place the plant in it with fresh soil so that the plant can get the benefit of fresh nutrients. Water your newly potted Rubber plant, and continue as usual. As your plant matures, it will need repotting less regularly, as growth will slow down. Your plant can be repotted every three to four years rather than every year, though you can change the topsoil in between repottings to help freshen things up and aid your Rubber plant in thriving. Fertilizer isn’t completely necessary for the survival of a Rubber plant, but if you want to achieve the large glossy leaves, then you will need to feed your plant. Various feeding routines will work for this plant, using your chosen fertilizer every few weeks or monthly during growing season. Plants that have just been repotted will not need fertilizer for the first three months in their new pot, as the nutrients in the soil will provide everything the plant needs for good growth. Young Rubber plants may benefit from a fertilizer high in phosphorus, as this encourages root growth and results in a strong and well-established plant. As the Rubber plant matures, you may wish to select a fertilizer high in nitrogen to encourage the full development of foliage (Royal Horticultural Society). As with most houseplants, abandon your feeding schedule during cold seasons when the Rubber plant halts its growth. Rubber plant propagation is not enormously popular among Rubber plant owners for a variety of reasons. Firstly, Rubber plants are so large that just one of these plants in a household is usually enough, and people do not have the desire to grow more and own a series of Rubber plants. Rubber plants are also very cheap to buy, so most people wanting to add a Rubber plant to their collection would choose this option. Rubber plants are also not the easiest plant to propagate, either, and efforts will often be wasted and lead to unsuccessful propagation. However, it can be done in two different ways, and makes a good challenge if you are keen to propagate your houseplants. Rubber plants make excellent gifts, so if you do decide to propagate your houseplant, you may decide to gift them to your friends and family. To propagate using a stem cutting, select a cutting to use in spring or summer. You will need a cutting which is at least six inches in length, and that has a minimum of two sets of leaves. Carefully remove the bottom set of leaves from the stem, and dip the base of the stem in rooting hormone. This step is not essential, though using rooting hormone will help to increase your chances of success. Place the stem in a gritty or well-draining compost or potting soil and cover it with a glass jar or clear plastic cup. Make sure that none of the leaves come into contact with its clear covering, trimming the edges of the leaves if necessary. The stem must then be kept in bright but indirect light, with constantly moist soil. It should be kept warm, with heating from underneath providing the best results. In a few weeks, when the stem has rooted, you can remove the glass or plastic covering. To propagate using air layering is to root a ‘cutting’ while it is still attached to the mother tree. This method is usually has a higher success rate, though it is slightly more complicated. The first step is to select a stem on your Rubber plant that is a minimum of twelve inches long. Carefully remove any leaves that sit immediately above and below where you plan to root the stem. Then, use a sharp knife to remove a one-inch ring of bark from around the stem, making sure the internal wood center remains intact. When finished, your stem should appear to have a bare ring around it. All soft tissue in the ring must be removed. Follow this up by applying rooting hormone to the ring, and then covering it with moist sphagnum moss. Cover the sphagnum moss with a plastic film, securing it in place around the stem. The sphagnum moss must be completely surrounded by the plastic wrap, which will help to ensure it remains damp. After a few weeks, you can remove the plastic covering and the sphagnum moss, revealing newly sprouted roots on the ring of the stem. Once this has been achieved, you can cut off the stem at the roots and plant it in a pot with potting soil or compost. Rubber plants do not require pruning, though as they are a fast-growing plant, you may wish to cut them back to keep them from getting out of control. To restrict the height, find the central stem and cut this back to your desired length with garden shears. The sap will likely seep from the place where you have cut it, so you may wish to wrap the top of the stem in tissue for a few hours to prevent a sticky mess. When the stem grows from the cutting point, it may simply continue to grow upwards, or, in particularly healthy Rubber plants, two or more new stems may grow from the cutting point. Knowing this, you could cut back the stems at selected points to encourage a rounder, more bushy looking plant. While the height of the Rubber plant will continue to grow unless restricted, the can be entirely controlled by pruning. If you don’t prune the plant, it will not grow outwards, and a slender, vertical plant will be the result. Or with careful pruning, you can encourage more outward growth. If this is done effectively, a width of around three feet can be achieved. Aside from strategic pruning, the Rubber plant only needs to have dead leaves removed when they appear. The Rubber plant, especially when grown indoors, does not tend to flower. As part of the fig family, a small fig-like fruit may grow on mature Rubber plants, though this isn’t common. New owners of Rubber plants sometimes believe their plant is flowering, but in actual fact, it is the emergence of a new leaf. As new foliage unfurls on the plant, it can begin in a shape which looks like a flower bud and is often red, confusingly leading owners to think that they have flowers growing on the plant. The Rubber plant contains a sap that is toxic to both animals and humans. Both the leaves and the stem produce a milky sap, containing caoutchouc, which is irritating to the skin, eyes, mouth, and gastrointestinal system. It can be especially painful if it gets into open wounds, so it is recommended that you wear protective gloves when pruning the plant to protect your skin from harm. The plant should be kept away from children and pets, though effects should be mild if they do come into contact with the sap. The toxicity of the Rubber plant is classed as level 4, which is the least toxic level a plant can be. Its effects can be as minor as mild skin irritation, or it could cause a severe rash and skin blistering. The sap is poisonous to pets, and, if ingested, can cause vomiting and internal discomfort, though it is not thought to be fatal (The University of Kansas Health System). This can occur for a number of reasons, and you will likely have to perform a process of elimination to understand what is causing your leaves to yellow around the edges. Overwatering can contribute to yellowing leaves, so if you suspect this may be the problem, then be sure to allow the soil to dry out between each watering, and this may solve the issue. A lack of nutrients could also cause leaves to yellow, which could happen in the form of poor soil, or underuse of fertilizer. If your Rubber plant is due to be repotted, then doing this and having fresh nutrient dense soil may fix the problem. If you haven't been utilizing fertilizer effectively, then this could also be the culprit behind yellowed foliage. Use a weak fertilizer little and often. A high-nitrogen fertilizer will help keep your leaves in their best shape. Some leaf drop is normal, especially among the lower leaves. However, if you're noticing piles of leaves around the base of your plant, then there is probably a problem with the conditions the plant is being kept in. Overwatering is the most common cause of Rubber plants losing their leaves. If this is the case, repot the plant in new soil and cut back on your watering schedule. One good watering a week should be plenty during the growing season. If you don't resolve the issue, it could lead to the death of your plant. If overwatering is not the cause of your leaf drop, then a sudden temperature drop or lack of light could be the problem. Try to ensure your plant is kept away from cold drafts, and make sure it is getting enough indirect bright light. Some people move their Rubber plants outside during the summer to encourage growth, which may help with leaf drop, but try to protect it from more than a few hours of direct sunlight. The most common problem for houseplants with large leaves is dust. Dust covering your plant's foliage can filter out the light, meaning the plant isn't benefiting from the bright conditions you have placed it in. This problem is easily fixed with occasional cleaning of the leaves. To do this, wipe the leaves gently with a damp cloth every few months. Thank you for reading! If you’ve learned something from this post, or if you have other information to share about Rubber plants, please leave a comment and share this post with your friends. We’ll also be happy to answer any questions you might have.